Invest in the present and future of KST’s international programming! KST has received a two-year $50,000 challenge grant from The Benter Foundation to use as a 1:1 match for community investment in our international programming. With these funds, KST is pleased to announce the launch of the World Stage Fund (WSF) initiative, an ongoing opportunity to bring culturally enriching international programming to the stage in Pittsburgh’s East End. In the past six years, productions from more than 19 countries have been hosted on the KST stage, along with a multitude of American projects with global themes and connections. The World Stage Fund will be a creative performance destination for artists from around the world to in one of Pittsburgh’s most distinctive communities. Within East Liberty, we are the connection that fuses art and culture into a larger sense of shared community. Diversity, in its myriad forms, is personified in the artists we serve and the audiences we attract. With your support, we will meet The Benter Foundation Challenge and make international programming an annual celebration of one of Pittsburgh’s most culturally rich neighborhoods. ​​Become a member of the World Stage Fund with an annual donation of $250, or be recognized as a Founding Member by pledging $500 or more each year for two years. Your pledge today means advance programming opportunities tomorrow. Help ensure that KST has the access and ability to secure world-class entertainment for Pittsburgh. 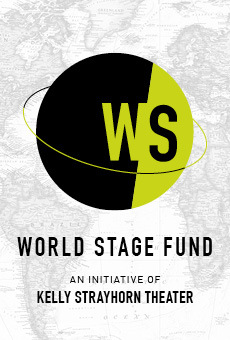 We look forward to welcoming you as a member of the World Stage Fund!